The Sure-Loc Sandcast Wasatch handleset gives you the beefy rustic look at a price that is hard to beat. This heavy handleset feels nice and solid on your door and the heavy duty latch will give you years of performance and security. - Fits doors 1 3/4" - 2" thick. - Unique Rustic Sandcast finish. - Solid forged Steel Latch and Spindle. When ordering lever handles or handlesets, we'll need to know the handing of your door. 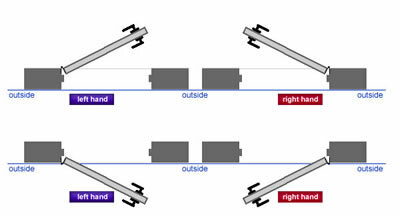 Door handing is the direction in which your door swings. If you order the incorrect door handing you will either have locks on the wrong side of the door, levers that are upside down, or levers that point in the wrong direction and keep the door from closing properly. Stand facing the door on the outside - If it's a locking door, stand on the side of the door where you would insert a key (or unlocking tool if it would be a privacy lock). If the hinges are on the left, it's a left hand door. If the hinges are on the right, it's a right hand door. We purchased a new wood southwest style door and this door handle to go with it. It is perfect for the door. The installer commented he had never seen a better fit an said he had installed hundreds of these doors. Asked where we got it and the cost, said he would have guessed it was a $500 set. Just installed this handleset on my new custom made alder wood door on my new log home. It looks beautiful. the handle set is a perfect color and looks true to the picture. 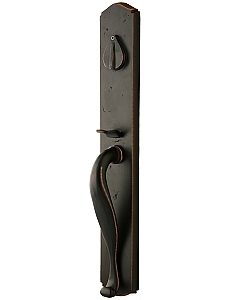 The door is old world style with straps and clavos and this handleset matches perfectly. It is heavy and well made and the price was great! Saw many sets similar to this for triple the money. Very pleased. Hardware was not correct to fit thickness of door, some screws long others to short, mechanism inside to long. Did not work for door thickness 21/4"
We Love the handle set..it's beautiful and durable and it looks perfect on our new craftsman style door entry!! It's wonderful!! Thanks for making an economical door handle that's not only beautiful and well made!! No problems - ordering - shipping - product - everything was great. Really love this hardware. I ordered the antique bronze and was surprised that there seemed to be copper showing through the finish but all in all this is beautiful and good quality too. Well pleased! I've already received many compliments on this door handle. Everything else I found like it was 3x the price. The installer said it was a little tricky to install, but it works well in the end. I'm very pleased with this purchase! The door handle is really nice. The dimensions fit exactly what we needed to cover up the large hole in the door. The solid look and feel gives our entry a presence that fits the nature of this 1906 house. I am very satisfied. The quality of materials and workmanship is high and certainly is a step up from what we had before. The handleset is high quality, has rustic beauty, wonderful performance, an low price. We purchased online and were thrilled with the outcome. Haven't installed it yet, cabin not ready, and the snow came. But we are looking forward to installing it in a few months. I know we will Love It, can't wait to show it off!! Very happy with this door handle really good quality we are thinking of purchasing another one. Great looking product. Installation is simple with all necessary components supplied. Mechanical operation is good. Bottom Screw stripped out during installation. The key cover has fallen off once so far . It was easy to fix but if it keeps happening then that will be a problem. The handle set looks like a very high end product and it feels the same way but the actual dead bolt seems cheap and sloppy. For the price I would have expected top end quality. But it really is a great looking handle set. The handle set is everything we hoped for - sturdy and durable; attractive; and scaled perfectly for our 8'-0" tall craftsman front door. 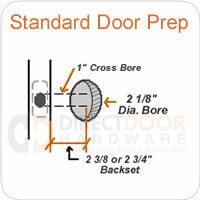 Two handle assemblies look great on two entry doors. Install was done by contractor who didnt seem to have any problems. Thanks for your help. Is this the only finish available? 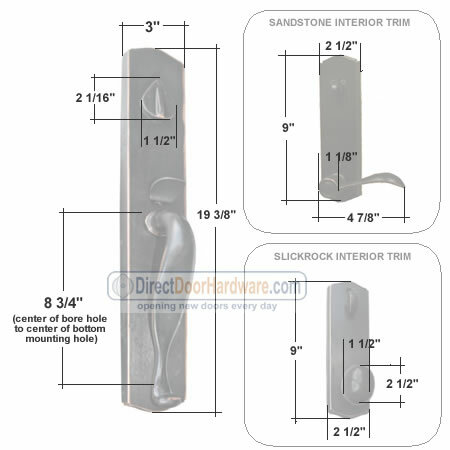 the description says it support doors up to 2 inches but one of the drop drowns let's you pick 2.25 inch door, which is correct? Is the finish on this Black? I have a double entry door. Do you have a dummy handle for the inactive door that would match? Yes, this handleset does come in the dummy function. You can order at the link below or call us to order. Does a dummy handle need the same bore as an active handle? Or is it just a surface mount? All of the measurements on our door appear to line up with this lock except for the backset. Our backset is 2 1/2". Will this lock still work. If so, which size back set do we need to order?